On a quiet tree lined street on the edge of town, and 1876 Victorian home replete with wonderful porches and gingerbread trim is the setting for Prairie Path Guest House. 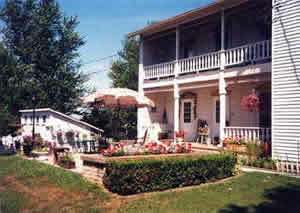 35 acres of fields,bluffs and trees which are full of wildlife and many songbirds. Three beautifully decorated rooms, with private and shared baths. 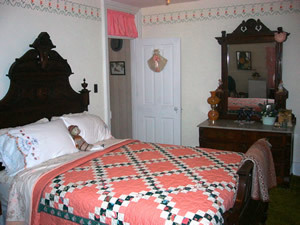 All rooms have queen sized beds with handcrafted quilts and marble top dressers. One room even has a small fireplace. Refrigerators, TV's, VCR's, hairdryers are there, all for you convenience. Early morning coffee is served on that beautiful upstairs porch and even afternoon desserts!! A bountiful breakfast of swedish pancakes, bacon, fresh fruit, juice and our famous raspberry cream cheese coffeecake may be served. We have many different tasty mentions with fruits and vegetables from our garden in season. We would love to hear from you!